So it’s no secret by now that I love IKEA. And when my little sister mentioned wanting house stuff for Christmas, I thought it would be a good idea to give her a bathroom in a can, (a garbage can to be exact). My little sis will be moving out of our parent’s house this summer and transferring to a four-year school. So while bathroom things don’t seem like that thrilling of a gift, I know she’s going to like this when she moves into her first apartment. Plus, she’s not into home decor, as illustrated by her frequent plea, “You should just decorate my whole apartment for me.” So I decided to take her up on her beg offer. I decided to get everything she’ll need in a bathroom (minus towels to stay on budget). I scoured IKEA’s website this week before I went because: A. It’s always good to have a game plan in a store like IKEA and B. I wanted to have some sort of theme in mind. I decided to base everything around this blue shower curtain. From there I went for a blue, black, and white color scheme. For $4.99 the price was great and I knew she’d love the color. I also bought her these two hand towels so even if she decides to go for different color towels, she’ll have some to match her decor. One of the best bargains was this bathroom set. For $2.99 it came with a soap dispenser, a soap holder, and a toothbrush holder. Granted, the quality isn’t going to last forever, but I look at all college decor as more of a right-now type of thing. I also got this bathmat, and a blue candle holder, which I plan on sticking one of my spare white tea light candles in. With the exception of a shower liner and some shower curtain rings, her present is ready. I plan to put all of the items in the garbage can and wrap it up! I wanted to stay around $25 so I don’t feel too bad going a few dollars over, especially when I know that everything will be useful. I could see this sort of idea translating to so many rooms. You could do a kitchen version and fill a mixing bowl with spoons and pot holders, or an office version with a drawer organizer filled with thumb tacks, paper clips, and a stapler. 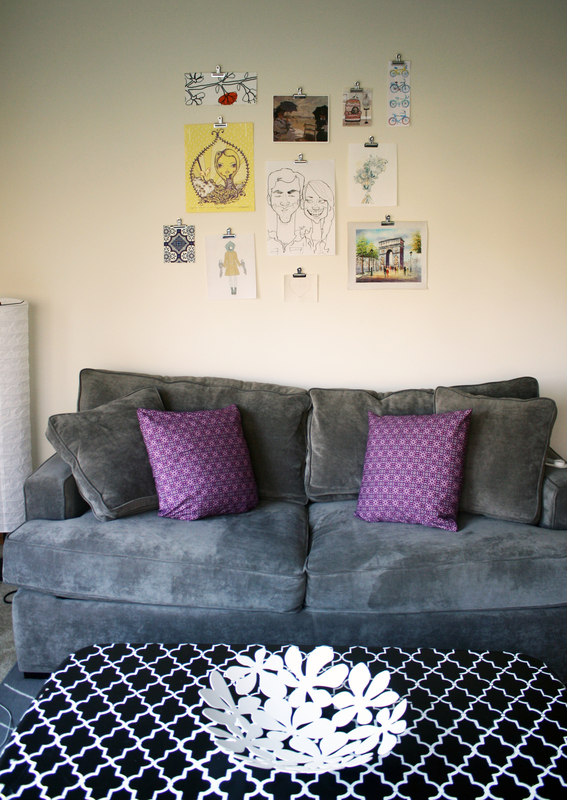 Don’t forget to come back later this week to find out what I did with the fabric! The term DIY evokes a certain image. A person hunched over a circular saw, cutting wood to make their fence. Someone googling what to do when things go wrong, and their project has gone awry. Or the triumphant grin of a person who has created something with their own two hands.DIY has had a resurgence in the past few years. As interest has grown, many different resources have opened or gained popularity throughout Seattle. As people seek out DIY resources, communities are being built and enhanced. In many ways, they’re returning to the way things used to be. Jessica Dally started the Seattle Free School five years ago when she realized Seattle didn’t have any resources like that available.“When I saw Olympia Free School I thought that would be a great thing to be a part of sort of a bigger group of people where you can share your skills or take a class,” Dally said. The school offers a diverse curriculum of classes, from crafts to improv to life skills. Professionals sometimes use the school to test out classes for the first time that they plan to charge for. “They’ll often use Seattle Free School as a way to kind of vett through the class for the first time for free and we totally encourage that because we get a free class,” Dally said. There have been people who take their classes with the hopes of passing the skill-sets along to others. When Dally taught a soap making class, a man from an island in Asia attended with the hopes of taking the knowledge along back home. He was hoping create a “sustainable enterprise” by selling them to tourists. “I thought that I would teach [people] how to make soap, not that I would teach [them] so that you could go to other places and teach other people,” she said. As the name implies, at the Seattle Free School classes are free. And in fact, the non-profit’s only overhead each year is the $10 spent to host the website. Everything else is free or donated. The teachers receive no pay. Dally said teachers have different motivations for volunteering their time. Some want to be become better at public speaking or figure out new ways to present information. Most want to give back to the community. A lot of classes take place in coffee shops, libraries or community centers. Some take place in less conventional places, like a class on fixing car brakes that Dally taught in her carport. Housed in a turn-of-the-century schoolhouse, the Phinney Neighborhood Association (PNA) has been offering classes and resources for the past 32 years. “During these 32 years we’ve just added more and more programs and classes and events,” said Alex Eckardt, marketing director at the PNA.The PNA is also home to a large collection of tools as part of their tool library.The library, which started 30 years ago, is filled with tools that PNA members can rent. Most of the tools have been donated by the community throughout the years. Patrick Dunn, program director at the PNA said the library was started with a community block grant. It was one of the first generations of community tool libraries. The libraries were popular at first Dunn said, over the years they faded away and only a few have remained. Recently, they’ve started to gain popularity again. For a weekly rental, they charge what a commercial company would charge for a day. Even though there are prices attached to the rentals, Dunn said, it’s merely a suggested donation. Some people don’t pay anything and other’s pay above and beyond the price to help support the library. This payment system allows people on a tight budget to still be able to take on DIY projects, Dunn said. Dunn estimates about 100 people use the library each month. It’s this community aspect that’s one of the most important parts of the resource, he said.“I think this encourages a little bit of a do-it-together spirit as well,” he said. This do-it-together form of DIY is gaining popularity, Dunn said.For Dunn, the efficiency of the library is a big draw. Instead of buying, housing, and maintaining a large collection of tools, people can access the library for tools that they would only use once or twice.“This is one collection that’s helping hundreds of people,” he said. When Dunn was working at the West Seattle tool library, people rallied their neighbors together to clean alleys and build playgrounds. Dunn is proud that the PNA is a hub and has created a sharing economy.“We’re sort of better together than we are in our parts, so we [should] share things,” Dunn said. Edward Johnson began his DIY house blog for the same reason many people do, to share with friends and family. He and his wife had just bought a house and posted the progress they were making on their renovations. 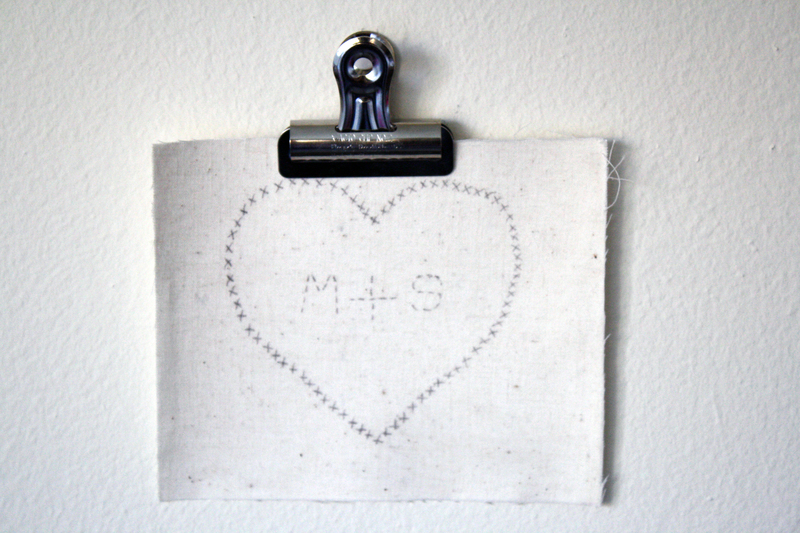 It was when he realized “he wasn’t crazy” and there were other people in the community interested in DIY and self-sustainability that the blog went beyond that. Now, DIY Seattle ranges between 15,000 and 30,000 page views each month.Johnson, a former mechanic, is a stay-at-home dad of three. Coming from a background where he was a jack-of-all-trades in auto repair, it only made sense to fix things around the house himself, to save money and for convenience. Despite getting a substantial number of views each month, Johnson said there isn’t much interactivity with his reader base on the site. He gets more feedback from his approximately 800 fans on facebook, but he feels a lot of ideas go unshared. There is no advertising on the site. Johnson does not make any money from it other than the occasional items, like fishing rods, which he sells under the sites “store” section.He posts when he can, working around birthdays, house renovations, and taking care of his kids. He doesn’t set goals regarding how often or how much to post. “I think it would be considered a job that I had to do and then I wouldn’t do it at all,” Johnson said.Growing up in the South, Johnson was surrounded by family who grew their own food. 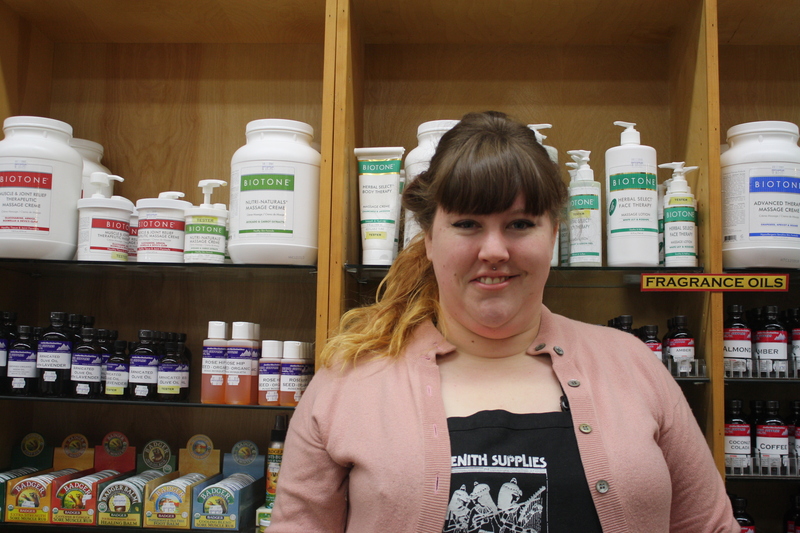 One of the biggest topics on DIY Seattle is food supply. Johnson has kept chickens, rabbits, and quail to eat. He also buys dry goods in bulk. The family does eat pre-packaged foods occasionally and goes out to eat. When they go out, they go to local independent restaurants. Johnson doesn’t have any long-term goals for the site. He likes that it is something he can do in his spare time. He said he wants people to realize that it’s possible to be self sustaining and not rely on big corporations or pre-packaged food. “I think a lot of people don’t realize what they can do if they try,” he said. 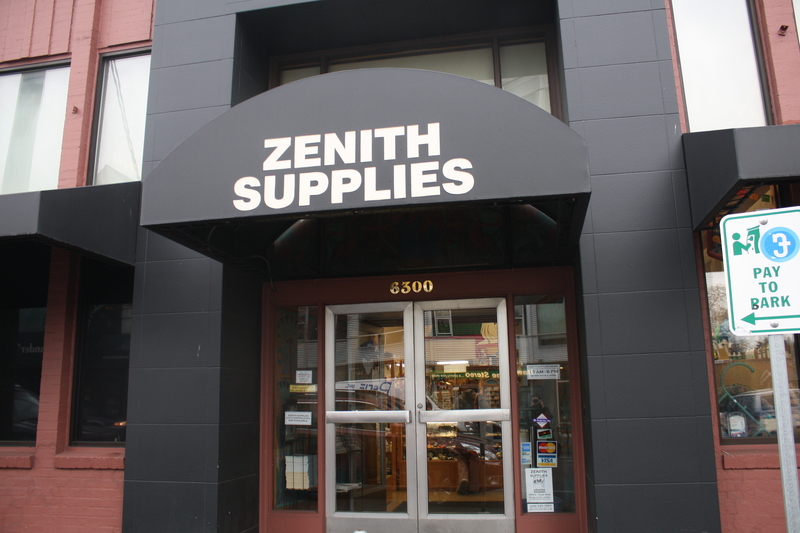 When I met with Liz McCarty from Zenith supplies last week, I asked her about essential oils and fragrance oils. I’ve heard a lot about them, and have used them in homemade soaps, but I had no idea what the difference was. Essential oils are distilled from plants. The plants are steamed, heated up, and they distill the natural oils. At Zenith, all of the essential oils are 100 percent pure. If there is one more than one type of oil, it is diluted, or there is anything un-natural in them, they’re considered a fragrance oil. “That purity is really important, because a lot of it you’re applying to your body,” McCarty said. Fragrance oils are not pure like essential oils. They’re often synthetic, or a blend of natural and synthetic, and made in a lab. 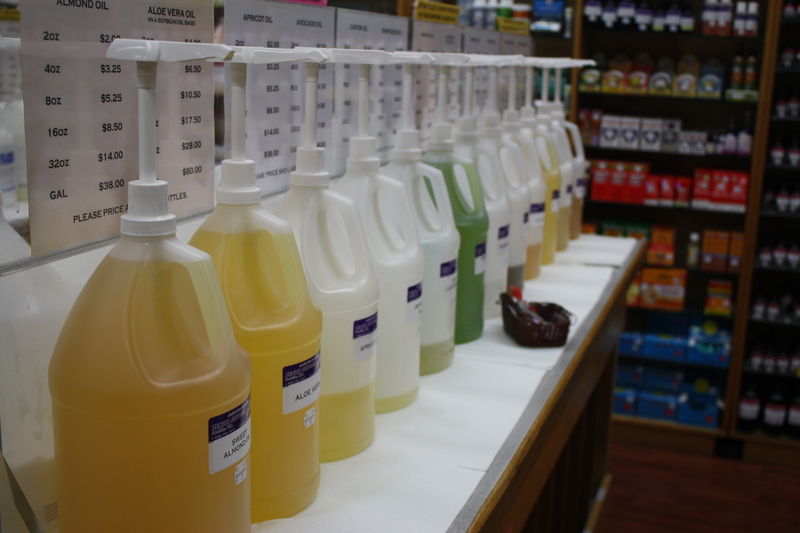 While people are often attracted to essential oils for their purity, fragrance oils have a place. There are some scents in nature that you cannot extract essential oils from. “No matter what you do to a cucumber, you’re never going to get cucumber essential oils,” McCarty said. 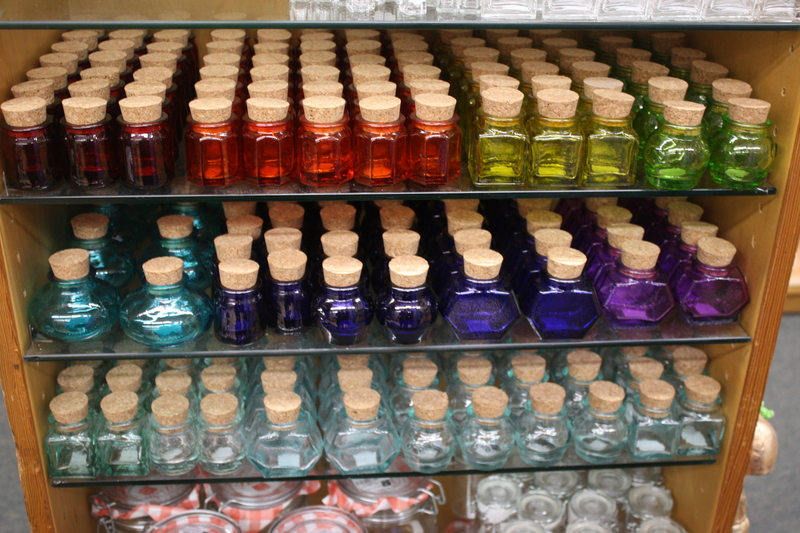 Other times, people will go for fragrance oils based on price. For example, at Zenith, an eighth of an ounce of essential rose oil is $68, which equates to $1 a drop. But rose fragrance oils are much cheaper, about $5 per ounce. Despite their purity, people can have reactions from essential oils just like fragrance oils. McCarty recommends diluting any oils and patch-testing them on a small part of the skin before going all out with application. McCarty said the sky’s the limit when it come to uses of both fragrance and essential oils. With Christmas right around the corner, I started thinking about what I, and other DIYers like me would most like to see under the tree next month. One of the biggest (and only) things on my list is Young House Love‘s book. It is being sold on Amazon and in stores as well. It retails for around $18, and claims to have 243 projects inside. I can’t wait to get my hands on a copy and read it. What are your must have DIY books? What are you hoping to find under your tree this year? When we first moved into our new apartment, I couldn’t wait to decorate and get things up on the walls. But I had three requirements. 1. The wall art had to feel like us. 2. It couldn’t make too much of a mess with the walls (big nail holes etc.) and 3. It had to be cheap. I am a huge fan of the popular DIY blog Young House Love and I’ve caught myself drooling over their hallway of frames. But since there’s no way I can afford that many frames or that many holes in my rental-walls, I dreamed up alternatives. When I decided to do this art wall, I planned by cutting out newspaper pages that were the sizes of the pictures and arranged them on the floor in a way that seemed to make sense (varying sizes, styles etc.). Then I put those on the wall. 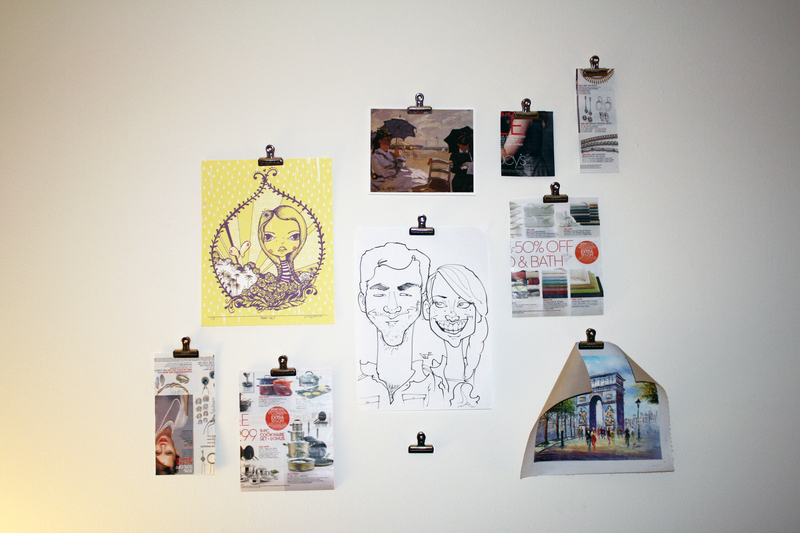 The art is hung with bulldog art clips. I got mine from the UW bookstore for 30 cents each. (Bonus: I used my Husky rewards and didn’t actually pay anything for them!) 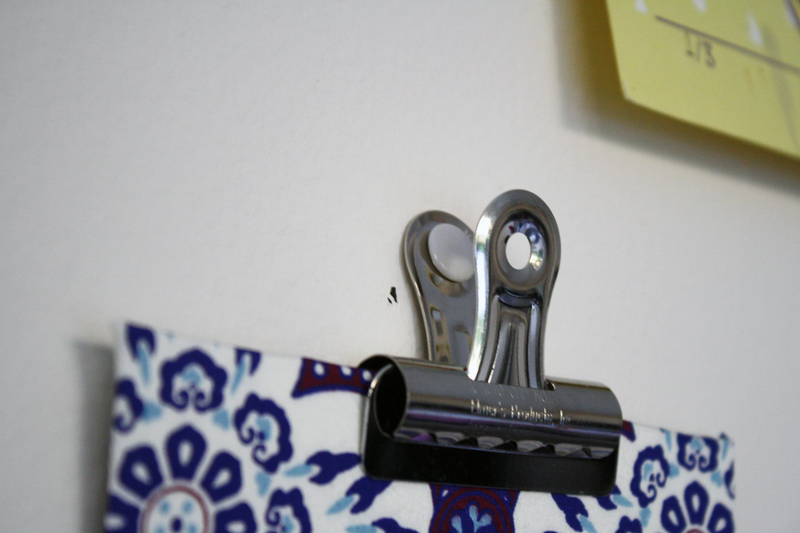 I just put them up with a small flat, white thumbtack. 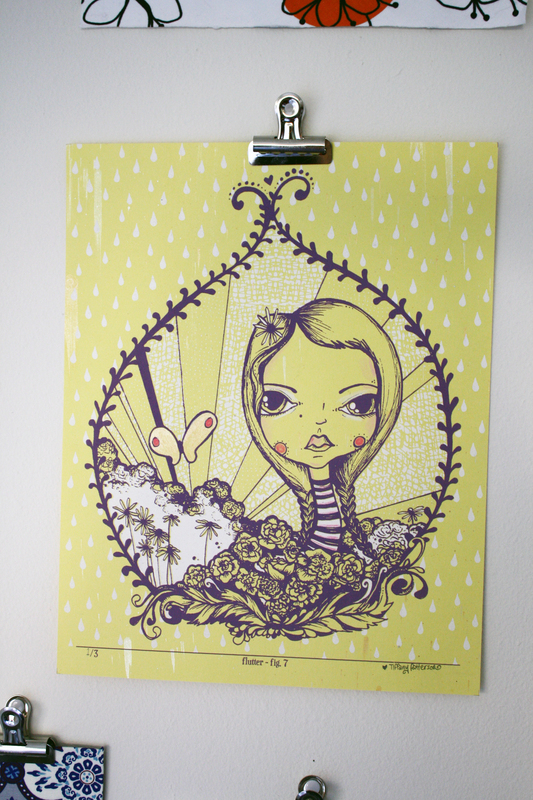 Some things are easier to hang than others, the lightweight paper hung just fine. But a painting on thick canvas curled like this when I clipped it up. To remedy that I just added some scotch tape to the edges and then it was flat against the wall and no one was the wiser. My favorite part about the wall is how personal all the art is. 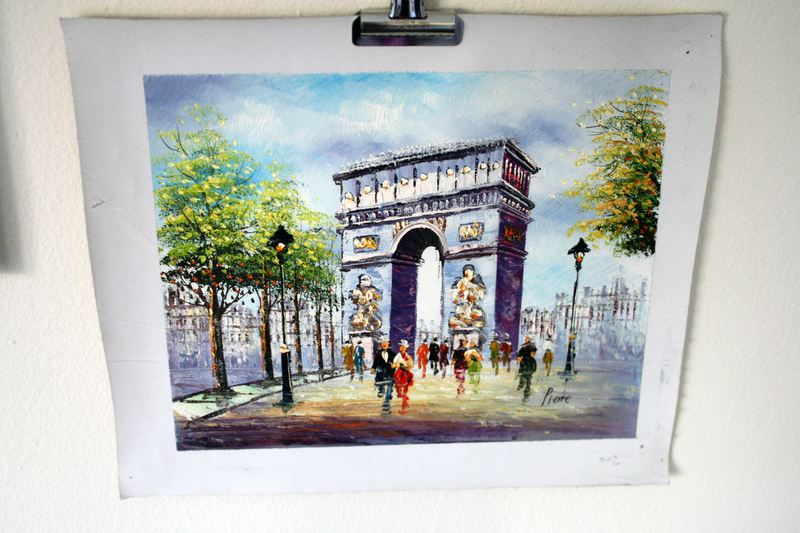 Like this painting my mom got me for my birthday while we were in Paris. 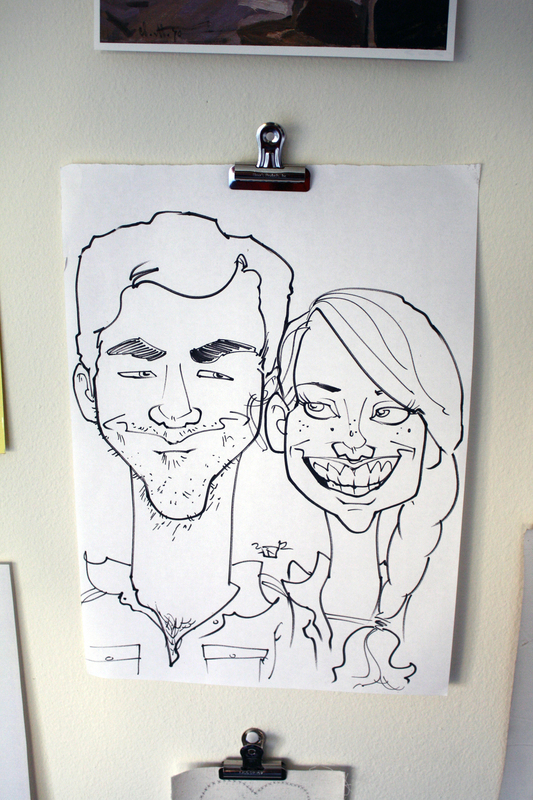 Or this picture we had drawn at the U-District Street Fair. 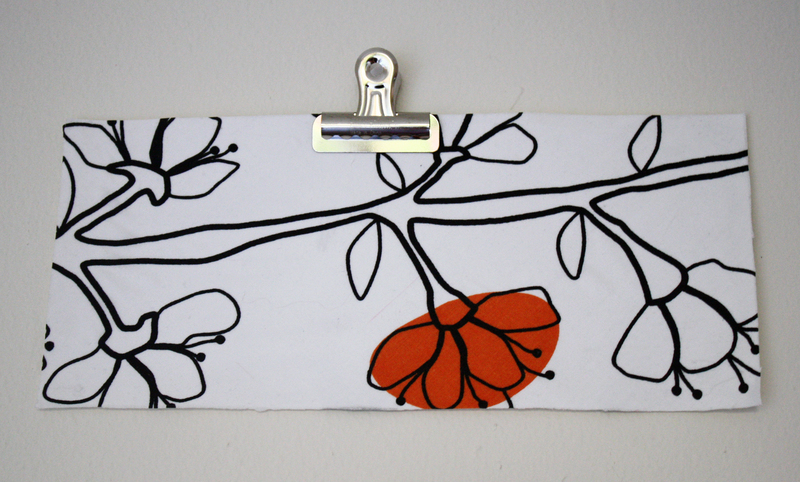 And some of it is homemade, like this IKEA fabric that I glued to card-stock. Or this one, inspired by this Young House Love post. Most of the rest are free printables that I found around the internet. This is a great place to find free art, and searching on Pinterest is almost always successful. I love our art wall and I can’t wait to see what it looks like as we find more and more things to add to it. All other materials were things that I already had. 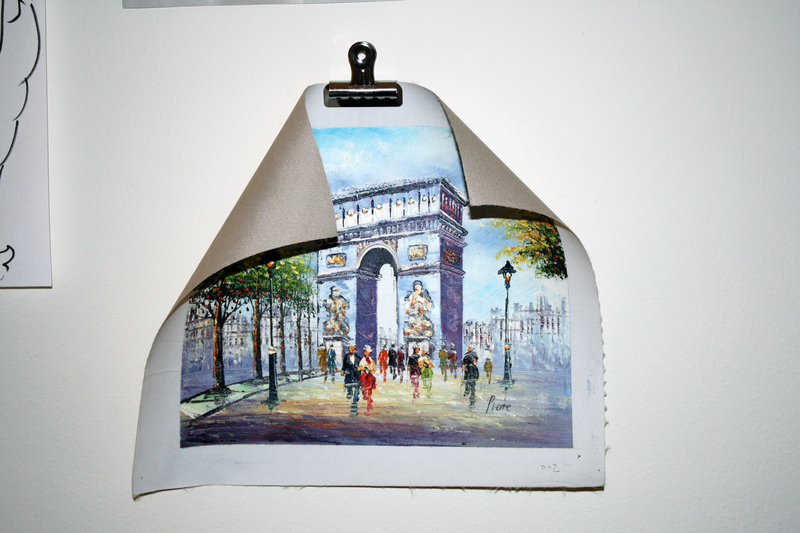 What is your favorite way to inexpensively decorate your walls? Let me know in the comments.